Recently I was driving down the freeway in Houston, Texas and I noticed a small business alongside the freeway that was making a BIG statement! Flying over the business was a giant American flag, which is common to see along Houston freeways. But next to that flag, instead of a giant Texas flag, was a solid blue flag with the letters proudly stating the owner's endorsement of "Romney - Ryan" to be our next president and vice-president. 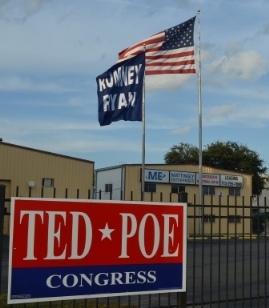 I did a quick U-turn and came back to find not only the flags, but a big Ted Poe for Congress sign adorning the property of Houston Business Owner, Tim Mattingly of Mattingly Enterprises. Mattingly owns several small businesses in Houston and across Texas. Mostly dealing in plastics, the companies manufacture a variety of products for the healthcare and oilfield industries, just to name a couple. Mattingly was quite forthcoming, as one might imagine from the flag, about his support for Gov. Romney and his reasons for being against President Obama. Mattingly spoke of a medical seminar he attended recently in Washington D.C. where the Obama Care the Independent Payment Advisory Boards (IPAB) were discussed. 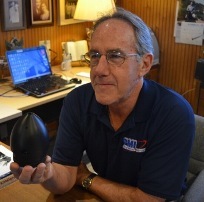 One of Mattingly's companies makes the plastic components used in heart pumps that are used to keep patients alive during open heart surgery. He said he was advised by a heart surgeon that open heart surgery would be all but eliminated because of the IPAB's interest in cutting healthcare costs. You may remember, former Alaska Governor, Sarah Palin coined the phrase "Death Panels" for these IPAB boards. Mattingly said certain types of major surgery would not be allowed "without passing the parameters that are set by the IPAB administration." He continued, "What they do is they're going to base whether or not you get the open heart surgery or any kind of surgery, is going to be based on your age and actuarial life expectancy. In essence, what they are going to do is ration health care." I asked under what conditions someone would be denied. Mattingly explained "You will not be "denied". Instead you will be told you "do not qualify"." Mattingly employs about 25 direct employees in Houston and about 100 statewide in his associated companies. These kinds of companies are the backbone of the American economy and are the direct object of Obama's war against small businesses. It is apparent that Obama would much rather create large government owned corporations like General Motors than the independent business they cannot control. Mattingly said, as a small business owner, "You want some certainty. One of the problems with Barack Obama is he is tearing apart the Republican and the Democrats. He is playing them off against each other. And that's not the best way to run a government. We need certainty. We need to know what the taxes are going to be. We need to know what the regulations are going to be. And right now they are pouring on as much as they can." Mattingly used to have another company that made nuts and bolts for the offshore drilling industry. Mattingly said, "We closed that business the day Barack Obama announced the moratorium against drilling in the Gulf of Mexico. We closed and liquidated that business the next day." And that is the very real effect of Obama's reckless policies. Obama takes an illegal act, closing drilling in the Gulf, and people shut down business and lay off people from good paying jobs. This is exactly why Obama has not been able to gain any traction in economic recovery. How many other companies were shut down when he made that horrible decision? How many other jobs were lost and families endangered or destroyed? Government cannot create jobs in the private sector, but they can certainly destroy them. We must bring back an atmosphere where businesses like Mattingly's know where government policy is going so they can feel confident in investing capital in risky start-up companies or in expanding current business ventures. We do not have that now, but we can in January if everyone will fly the flag of American freedom high, like Mattingly has done, and get out an vote. Your vote is the key to our economic recovery.